While I have always liked baking cakes, my knowledge of baking was limited to cakes. I tried baking bread a couple of times when I was in college. I gave it up since I didn’t meet with too much of success. About a year back when I had newly joined the world of food blogging, I saw Aparna’s baking group, “We knead to bake”. I was so excited when I got to know more about it, but I was a tad too late to join the group in 2013. So I had mentally noted that I had to join the group in 2014…and here I am, all set to learn!! My first bake for the year is Focaccia Caprese. Focaccia is a type of flatbread that is found all over Italy and baked in different ways. It is a soft and spongy bread which is about 3/4″ thick. Focaccia Caprese gets its name from the salad, “Insalata Caprese” (famous in the island of Capri located off the Italian coast). The ingredients of the salad include fresh tomatoes, basil and fresh buffalo mozzarella. So a basic Focaccia dough topped with sliced tomatoes, mozzarella & basil (in addition to the usual olive oil and herbs that are typically used) makes the bread Focaccia Caprese. Focaccia can be served as a snack or as a light meal with soup or salad. Since I was baking bread after a long time, I halved the quantities to make one medium sized bread. However, for the purposes of the blog i have retained the original quantities in the recipe as provided by Aparna. In the process of baking focaccia caprese, i learnt a few things about baking. 1) Good yeast is very essential for good baking. If the yeast is not good, the dough will not rise. I had not heard about instant yeast till I joined Aparna’s baking group. This recipe uses instant yeast, which can be directly mixed with the dry ingredients as opposed to dry yeast that needs to be activated in warm water. Instant yeast is not easily available in stores in India. While I got my sister to send me instant yeast from the US, you can try zansaar.com for Gloripan/Bobs Red Mills instant dry yeast or gourmetco.in for Mauripan instant dry yeast. 2) Vital wheat gluten is a new ingredient that I learnt about. This is pure gluten which makes the bread more elastic. It is usually used while baking with whole wheat which does not develop enough gluten on its own. The original version of the recipe is from The Kitchen Whisperer and the adapted version from Aparna Balasubramanian. Place all the ingredients in a bowl and whisk them together. Keep this mixture aside till required. Put the instant yeast, sugar, flour, salt and oil in a mixing bowl and mix well. Then add 1 cup of warm water (and as much more as you need) and knead until you have a soft elastic dough which is just short of being sticky. Shape the dough into a round and place it in a well-oiled bowl. Turn it around for a bit so that the oil coats the dough. Cover and let it rise till it almost doubles in volume. This should take about 60-75 minutes. With this dough you can make two medium sized Focaccias. For the rectangular Focaccia, take two rectangular pans (approx 11" by 7") and oil them well. Divide the dough into two equal portions and lightly roll them till it is about ¾" thick. Place the rolled out dough on the baking pan and push the dough with your fingers to keep it evenly thick throughout. Keep the rolled out dough aside for about 20 minutes. Lightly oil your fingertips and press into the dough creating dimples on it. Brush the surface of the dough liberally with oil. Bake the focaccia at 210C for about 18 to 20 minutes till it is almost done and is beginning to turn golden brown. Take the Focaccia out and increase the temperature of your oven to 230C. Lightly drizzle some of the herbed oil over the Focaccia. Now arrange mozarella sliced on the bread, leaving very little space between the slices. Arrange the tomato slices over this and a little sprinkle the chopped basil over this. The topping should cover most of the surface of the bread. Drizzle some more of the Herbed Oil over the topping and bake the bread again for about 5 minutes or so till the cheese melts. Remove from the oven and garnish with fresh basil leaves. While it is hot, cut the Focaccia into slices. Serve when warm or at room temperature!! If you cannot find bread flour, you can add 1 tbsp of Vital Wheat Gluten to 3½ cups of all-purpose flour and mix it well together. If you do have access to either bread flour or vital wheat gluten, use 3½ cups all-purpose flour. If you don’t get fresh buffalo mozzarella you can use any regular mozzarella instead, or any stringy kind of cheese. The dough can be mixed and kneaded by hand or using a food processor. I kneaded the bread by hand and i was a little apprehensive about the outcome. But my fears were unfounded, the bread turned out nice and spongy. I placed an aluminium foil on the base of the tray and then oiled the foil as i have a dark baking tray and did not want to risk burning the base of the bread. Your bread looks good. My first time at we knead to bake too. I love baking breads. Thanks Sunita!! Am happy to be a part of 'we knead to bake' :). Do u blog as well? This focaccia looks amazing! I love all the colors. 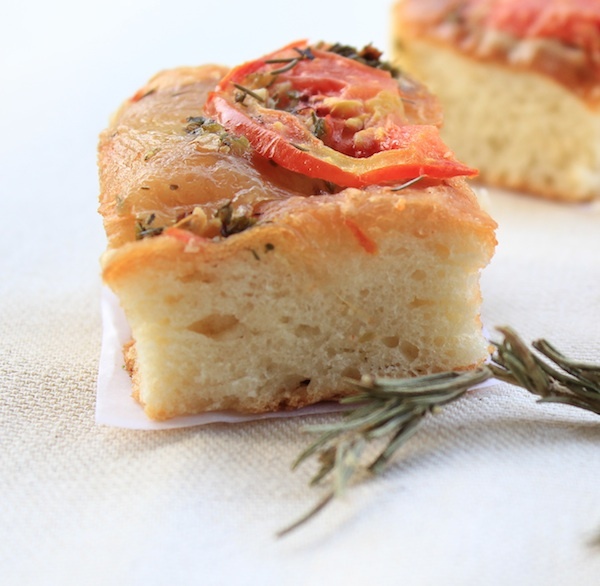 I need to try making focaccia sometime!